Most of us have some seemingly simple task, conversation, or decision that we know we need to tackle, but so far, we haven’t. It turns out that we can change everything one 5 second decision at a time. 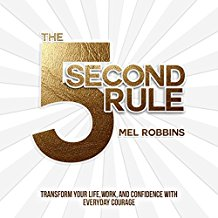 In her book, “The 5 Second Rule,” Mel Robbins explains that we are never going to “feel” like doing the things that need to be done no matter how right or good they are for us, and this book gives us a practical way to take action.